There are several reasons why the preservation rates calculated by Foote et al. (1999) are likely to be overestimated. These all relate to the problem of circularity when interpreting the completeness of the fossil record through analysis of the fossil record alone. First, methods for assessing the completeness of the fossil record based exclusively on the fossil record can only account for gaps that occur within known lineages. They are insensitive to the existence of larger gaps, both chronological and geographical, and will overestimate completeness where such gaps occur. Foote (1997) demonstrated that the method used by Foote et al. (1999) will overestimate preservation potential where chronological gaps occur, with larger gaps within a given chronological range resulting in a larger overestimation. Even simple temporal variation in preservation probability will in most cases cause a slight to moderate overestimation of completeness (Foote, 1997). The primate fossil record as a whole has two large gaps. One, already noted above, extends over a period of about 6 MY during the middle Oligocene. The other is the gap between the origin of the order and its first fossil appearance, a gap which most would agree to be at least 5-10 MY and which we estimate to be over 25 MY. More gaps become apparent when individual lineages are considered. In the most dramatic primate example, documentation of Malagasy lemurs was, until very recently, strictly limited to subfossils just a few thousand years old. Yet it was known that lemurs must have existed much earlier, as the sister-group (lorisiforms) is documented by fossils that are at least 20 MY old (Szalay and Delson, 1979), and possibly over 30 MY old (Simons, 1995), thus documenting a ghost lineage (Norell, 1992) for lemurs extending at least that far back in time. Recent discoveries of fossil lorisiforms in the Fayum have now increased the minimum age of the lemur ghost lineage to about 40 MY (Seiffert et al. 2003). Very recently, a strepsirrhine primate (Bugtilemur) interpreted as a possible relative of the lemur family Cheirogaleidae has been recovered from Early Oligocene deposits of Pakistan (Marivaux et al., 2001). Rather than closing a gap, however, this new find illustrates just how little may be known about key aspects of primate evolution. The lemurs are a diverse group of modern primates known, until now, exclusively from the island of Madagascar. To explain the presence of a lemur in the Oligocene of Pakistan combined with the, as yet, total absence of fossil lemurs from anywhere else in the world, requires the contemplation of some fairly elaborate biogeographical scenarios. Figure 2. Geographical distribution of individual modern and fossil euprimate species, taking the mid-range point in each case and plotting in relation to present-day continental positions (updated from Tavare et al., 2002): (A) modern and subfossil primates; (B) fossil species between the Late Pleistocene and the Late Oligocene; (C) fossil species between the early Oligocene and the early Eocene. (B) and (C) are separated by a fossil-free gap of 6 MY. Note the progressive southward shift from (C) to (A). 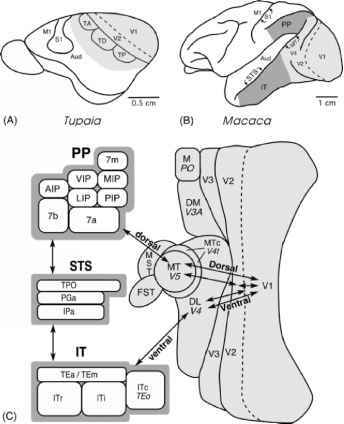 evolution, sites yielding fossil primates are largely restricted to these two regions (Figure 2C). A direct reading of the known fossil record would suggest that primates originated some time during the Paleocene in the northern continents and subsequently migrated southwards. An alternative interpretation is that primates originated earlier in the relatively poorly documented southern continents and expanded northwards when climatic conditions permitted during the Eocene and, to a lesser degree, during the Miocene. The preservation rates proposed by Foote et al. (1999) for modern eutherian mammals as a whole are based either entirely (for the Cenozoic rates) or to more than three quarters (for the Cretaceous rates) on North American faunas. North America is the best-sampled region in the world, and estimates based on that region will necessarily overestimate the preservation rates of groups with an almost worldwide distribution. Our method also implies that approximately 5% and no more than 7% of all primate species that have ever existed are known from the fossil record. This low value does not seem unrealistic, as only 6-7% of all living primate species are known from the fossil record, a record that is expected to be better than the average, given that it is dominated by easily collected and relatively common Pleistocene sediments. In addition, the belief underlying any direct reading of the fossil record—namely that most of primate evolution has by now been unearthed and described—is easily refuted by the ongoing rate of publication of new species of fossil primates (Figure 3). Figure 3. 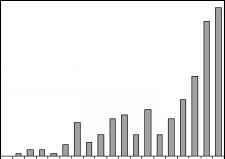 Histogram showing the numbers of new species of fossil primates by year of publication, grouped into decades. To produce a precise estimate for the time of origin of primates (or any clade) using our method requires knowledge of the true diversity curve of the clade, of the relative sampling intensities of each stratigraphic interval, and of the mean species longevity (although the first is the most important in influencing the resulting estimates). As the values of these parameters are not known in detail, our estimates of the time of origin of primates must remain provisional. It is significant, however, that a number of our models produce dates concordant with various molecular estimates using calibration with fossil dates outside the primate tree (Arnason et al., 1996, 1998; Eizirik et al., 2001; Hedges et al., 1996; Huelsenbeck, 2000; Janke et al., 1994; Kumar and Hedges, 1998; Murphy et al., 2001b; Springer et al., 1997). The poor sampling that we have inferred for the primate fossil record is unlikely to be restricted to that group. Cretaceous divergence times for primates and other modern orders of mammals should now be considered the more likely scenario, in which case the influence of continental drift has probably been considerable (Easteal et al., 1995; Hedges et al., 1996; Martin, 1990; Murphy et al., 2001b). Clearly, fossil evidence from appropriate regions is needed to test this proposition. In the case of primates, it can be predicted that early members of the order showing characteristic morphological features lived somewhere in the southern continents (i.e., on parts of the former Gondwanaland) approximately 85 MYA.